A supernova is a stellar explosion. They can occur when a large star exhausts its ability to fuse hydrogen into higher elements, and its core collapses. The resulting rebound rips apart the outer layers of the star, creating a supernova while the remains of the core collapses into a neutron star. Another type of supernova, known as a thermal runaway or type Ia, occurs when a white dwarf is a close companion with another star. As outer layers of the companion are captured by the white dwarf, it can trigger a runaway nuclear reaction that rips apart the white dwarf. This latter form always has about the same absolute brightness, which is why they are used to measure the distances of far galaxies. A type Ia supernova, you might imagine is incredibly bright. The amount of energy released by such a supernova is more than the amount of energy the Sun will release in its entire lifetime. Now imagine a supernova ten times more powerful than that. Such a stellar explosion is known as a superluminous supernova, or hypernova. Such a super-powerful stellar explosion would be extremely rare in modern galaxies, because they mark the final moments of the largest of stars. Those at the upper limit of mass possible for a star (about 150 -200 solar masses). Such stars are rare today, but it is thought that in the early universe they were more common. Thus, there has been an effort to find hypernovae in distant galaxies, since the travel time of light means we see such galaxies from a time when the universe was much younger. In 2007, a hypernova known as SN2007bi. Not only was it extraordinarily bright, but it remained near its maximum brightness for nearly five months. This is unusual for a supernova, but such a slow decay is exactly what would be expected for a type of supernova known as a pair-instability supernova. With a typical core-collapse supernova, the fusion of elements during the collapse of the core produces a great deal of energy in the form of neutrinos and gamma rays (high energy photons). As the gamma rays radiate out from the core, they collide with the outer layers of the star, preventing them from collapsing inward. This somewhat limits the size of the supernova explosion. With very massive stars, the gamma rays have so much energy that they produce pairs of electrons and positrons. You might recall that we use this effect in gamma ray telescopes. Since the gamma rays produce particle pairs, they don’t work to push back the outer layers of the star. 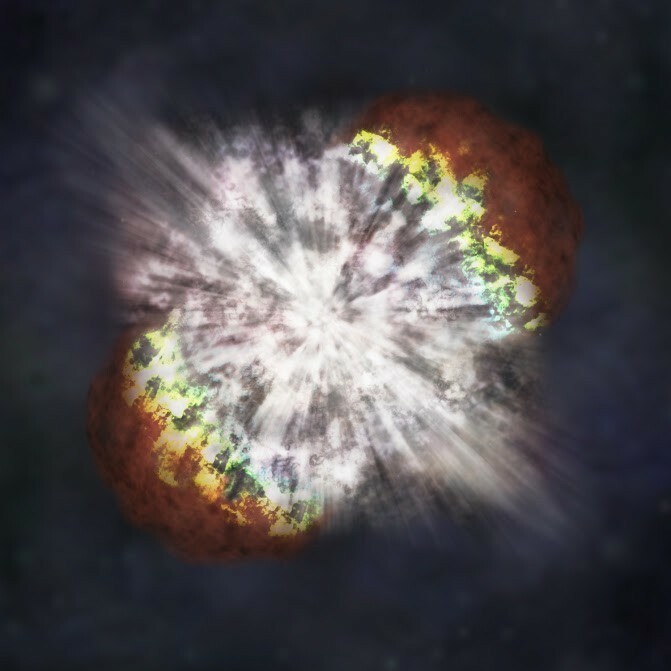 As a result, even more of the star collapses inward, further heating the core and producing more intense nuclear reactions, until eventually the star is completely ripped apart by the hypernova explosion. With SN2007bi, it now seems that pair-instability supernova exist. Since such supernovae completely destroy themselves, they would typically release massive amounts of heavier elements into the cosmos. Such elements were crucial to the formation of stars such as ours and our solar system. It is very likely that a similar explosion produced the elements such as carbon, iron and oxygen that exist in your body today. DON’T ALL THREE TYPES OF SUPER NOVAS RELEASE HEAVIER ELEMENTS INTO THE ADJACENT SPACE? Yes they do, except the Pair-instability supernova makes a heck of a whole lot of it! Typa 1a and the pair-instability supernovas are my favorites because we don’t lose valuable matter into an atom destroying neutron star or a black hole. Comparing that astronomical event of a Type II to our world, its like wasting a lot of good food left on the plate by dumping it into the garbage can.